This feature allows to import complete libraries and create files of any extension (.JS, .CSS, .PHP…) that can be used in your projects, making it easier to reuse some of the source code. This feature is available in the menu Tools > External Libraries, where you can manage the libraries of your project. To use this functionality, you need to use the macro, sc_url_library() and the sc_include_library() (Only for PHP files)to import the library to the applications. To create a library, click on Create a new library. Next, inform the library name and the access level of the library. Public - Available for all the ScriptCase projects. Project - Available only for the project it was created in. All the public and project libraries are listed here. This page allows you to select the libraries that will be part of the project, delete the unnecessary libraries, rename or edit them. This option defines a library that will be used in the current project. The enabled libraries, for this project, can be differentiated by the checkmark next to the name of the library. Selecting a library to be used in the project, the icon changes color when you click on the button “Save the library to the project” and enabled, you need to click on the button to save the modifications. To rename a library just click on “rename”, and then inform the new name for the library. To rename a library, you will need to change all the includes of the library in the events of the applications. Clicking on “Editing”, you can create or upload files to the libraries. You can create files in a folder, with the goal to organize your files. On Footer of the page, you can view the options to create or upload the files. To create a directory, click on “New Directory” and inform the name of the directory. 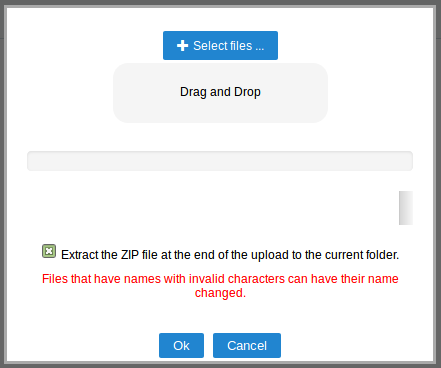 To create a file, click on “New File” and inform the name and extension (it is indispensable to inform the file extension). This tool, allows to upload files and external libraries and used them in the project. Clicking on upload, select the desired file. Delete the libraries and all the files contained in them. Before deleting the library, be certain that it is not being used, you will not be able to recover deleted libraries. Like mentioned before, to use the libraries, you need to use the macro sc_url_library() and the sc_include_library() (Only for PHP files).